• High-quality, smooth-to-the-touch stainless steel. OUTSMART EVEN THE CLEVEREST THIEVES with the most secure RFID Blocking wallet on the market. RFID scanning thieves won't be getting anywhere near your credit cards, smart cards, or driver's license information. TRAVELING SHOULD BE ENJOYABLE without having to worry about identity theft predators around every corner. Now you can travel armed with the protection you need to guard against obnoxious digital thieves! STYLE AND DURABILITY GOT MARRIED with our sleek and classy wallet design. The stainless steel metal will also protect against water damage, without damaging your clothes. It's a win-win! GIVE THE GIFT OF "SECURITY" IN A BEAUTIFUL GIFT BOX. Who wouldn't want to feel protected against identity theft, right? WE. HAVE. YOUR. BACK. 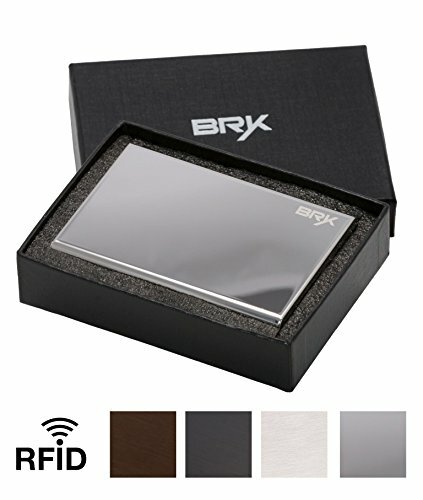 We created our RFID Blocking wallets with you and your assets in mind. No need to worry about RFID readers in stores, airports, or crowded streets. We also provide you with an industry-leading LIFETIME GUARANTEE, so you can feel completely safe ordering our innovative wallets today! If you have any questions about this product by BRYK, contact us by completing and submitting the form below. If you are looking for a specif part number, please include it with your message.